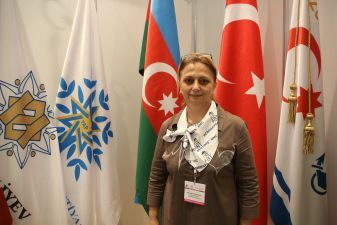 “Azerbayraq Tikish” LLC delas with printing on textile materials of various formats, using technology and materials from the world's leading manufacturer – Mimaki (Japan). Our product line includes state and corporate flags, national clothes, pendants, scarves, tablecloths, bags, ribbons, labels, symbols of sports teams, etc. During ten years of our operation, we have improved the quality and range of products. For example, flags for indoor and outdoor use vary in both the quality of the material and the quality of the print. Our clients are state organizations and private companies, including sports pools. Our company is well known in Azerbaijan and that's why we can meet our old contacts among the visitors; we resume professional dialogue with those clients who have been using the services of “Azerbayraq Tikish” LLC for several years already. We feel a great interest in our products at the exhibition and therefore, we appreciate both the relevance of this event and the way it has been organised.